When doing my research before heading to Chernobyl, I found it difficult to find information on where 2015 overnight tours stayed at and ate at. While there is some information out there, much of it seemed to be several years old, and therefore potentially out of date, or was written in Russian. I also knew nothing about Ukrainian food. While the hotels or restaurants aren't likely to sway someone from doing a multi-day tour of Chernobyl, I at least found it comforting to have an idea of what to expect. I stayed at the Hotel Desyatka in Chernobyl Town. I have also seen this hotel referred to as Rektan on some websites. The hotel is about nine miles from the nuclear power plant. As shown in my below picture, the radiation inside the hotel rooms at .14μSv/h is not much higher than Kiev which was around .11μSv/h and is therefore perfectly safe for a short stay. Desyatka is a modern hotel built using some sort of modular construction method. It is not the older, Soviet style hotel in Chernobyl. While the rooms are relatively simple (I assume the 80s decor is a more recent Ukrainian style), the bed is comfortable enough, the heating works well and has a TV. 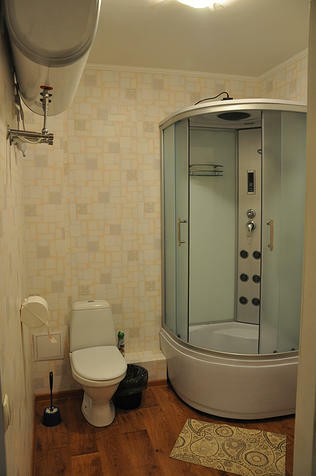 At least in my wing of the hotel, several rooms shared two bathrooms with showers. Pictures of the bathrooms are on the hotel's website. I ate three meals at the hotel restaurant, a lunch, dinner and breakfast. The meals were a mix of what Americans would call family-style coupled with everyone being given an entree. While you don't choose your dishes, the staff bring out a wide enough range of food that everyone should find enough to eat. There is a lot of different kinds of meats, but the meals are pretty balanced with apples, salads and other vegetables at each meal. Given where you are, what you are there to do and the restrictions on eating and drink outside, even very picky eaters like me make do and eat whatever is put in front of you. You do a lot of walking during the day and are hungry enough that you just eat everything even if you are not sure what the dishes actually are. The lunch on the second day was in the nuclear power plant's employee canteen. On entering the canteen, you pass through radiation checkpoints like the ones at the exclusion zone checkpoints. Like you would do at a school canteen, you grab a tray and go down the line. Similar to the hotel's restaurant, the dinner ladies, who don't speak any English, give you whatever they are serving that day. Again no choices, but no one complained. While you are in a separate section, eating with the plant employees is an interesting experience. Pictures of the hotel and the various meals I ate are after the break. More pictures of the hotel and its restaurant can be found on its website: www.rektan1.com.